Freshly picked from the tree or used to make jams, jellies or sweet toppings for cakes and pastries, otaheite apples are more versatile than you think. 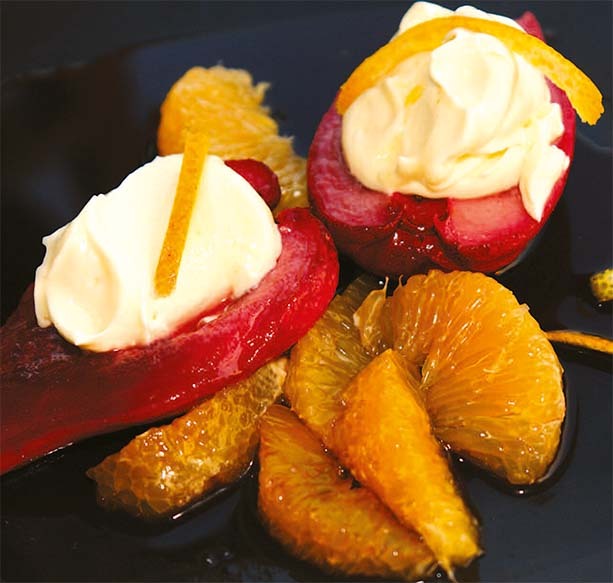 Kingston-based Chef Dexcar Denton whipped up this tropical delight, using poached otaheite apples and a delicious ortanique (see glossary) liqueur. To make liqueur: Boil ortanique juice with rum and honey over low heat until reduced to about 2 tablespoons. Allow to cool then refrigerate. Cut apples in half and poach over low heat in wine, 2 cups sugar, cloves and cinnamon for five minutes. Leave to cool in liquid reduction. In a metal bowl, beat cream with two tablespoons sugar. Before standing, add cold orange rum liqueur slowly and whip until firm. Arrange the halves of the otaheite apple on plates. Fill with whipped ortanique cream. Garnish with ortanique segments. Drizzle the sauce used for poaching on top and serve immediately. Pears or apples for otaheite apple. *Any sweet citrus juice for ortanique juice. Or substitute a sweet liqueur (peach, for example) for ortanique liqueur. Recipe excerpted from Nyam Jamaica, by Rosemary Parkinson.